We are back to our daily swims at the lake. 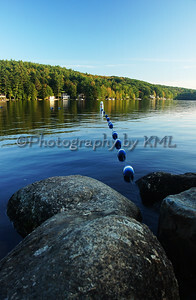 It has been over a month now, and the water has warmed up considerably since we first began swimming this season. Even though it has been quite a rainy summer so far, it hasn't slowed us down. The fog and raindrops that seem to "fall up" from dropping in the water make the swims a great experience still. We just make sure to keep an ear tuned for thunder and an eye for the lightening - getting fried while swimming is not in the plan. It didn't take long for us to get back into going along the lines - keeping our "old fogies" pace helps a lot. It feels so good to be back to our swimming -and we intend to enjoy every minute of it too!